Appearance: Dark coffee brown with a beige lacy head. Nose: Slightly toasty, sweet malt. Palate: Sweet and a little sticky. Oatmeal, molasses, effervescence. Finish: Some bitterness and a bit of smoke. Dry. Parting words: Moher Stout is named for a scenic group of cliffs in Ireland that were, according to the bottle, the scene of at least one shipwreck. Anyway, this differs from their Uncle Steve’s Stout in two ways. First, it’s at “double” strength and second oatmeal is used in the making of it. These two factors lift it above Uncle Steve’s and into highly recommended territory. Unfortunately the high price takes it down a peg from there. Moher Stout is, like I said, recommended. Appearance: Dark chocolate brown with a short-lived lacy head. Nose: Bourbon, sweet malt, strawberry licorice, light molasses. Palate: Medium bodied and powerful. Coffee, anise, rye recipe bourbon, piloncillo. Finish: Light with a little bourbon and molasses. Parting words: Aging beer is something I got really interested in a couple years ago and it’s starting to pay off now. I had an aged Arcadia Imperial Stout at the Arcadia brewpub once and it was good but was all anise and little else. This is much richer but oddly playful. The various flavors pop up seemingly at random on the palate to engage in a tug of war with the others. The result is not well integrated but still very enjoyable. If I have a complaint, it’s that it’s too enjoyable. I almost never get drunk off of beer but after just one of these I felt a pretty big buzz. At 12% ABV this beer is best drunk in the same way as a fortified wine. Find a friend or two and split a bottle after supper. I don’t remember what I paid for it but I think it was around $8 for one bottle which I think is fair for a liquid dessert. Barrel Aged Imperial Stout is recommended. Put it away for a while if you can. Style: Dry stout aged in Wild Turkey bourbon barrels. Appearance: Chocolate bown with a big tan head. Nose: Roasted malt, soy sauce. Palate: Mildly sweet and bitter with some butterscotch and salted caramel. Finish: Mildly sweet and a little fruity, then a touch of bitterness. Parting words: My first encounter with an Anderson Valley beer was not a very positive one. This is much better. It’s not particularly ambitious or edgy. It’s just a stout that has spent some time in a bourbon barrel. But it’s tasty. The barrel contributes some very nice sweet butterscotch flavors without making it too boozy or sappy. One might even call this a session bourbon barrel stout. Maybe. The price isn’t too bad for a product like this, but it is near the upper limit of what I would be willing to pay. Knowing the origin of the barrel is a nice bonus too. Anderson Valley Bourbon Barrel Stout is recommended. Appearance: Dark coffee with a big head. Nose: A bit of malt, mocha. On the palate: Full bodied and fizzy. Cappuchino, roasted malt, tirimisu. Finish: Coffee ice cream, long, bitter and creamy. Leaves a bit of sticky sweetness on the lips. Parting words: Yes, we mostly do Michigan beers around here, but without a little context my reviews wouldn’t be worth what you paid for them. 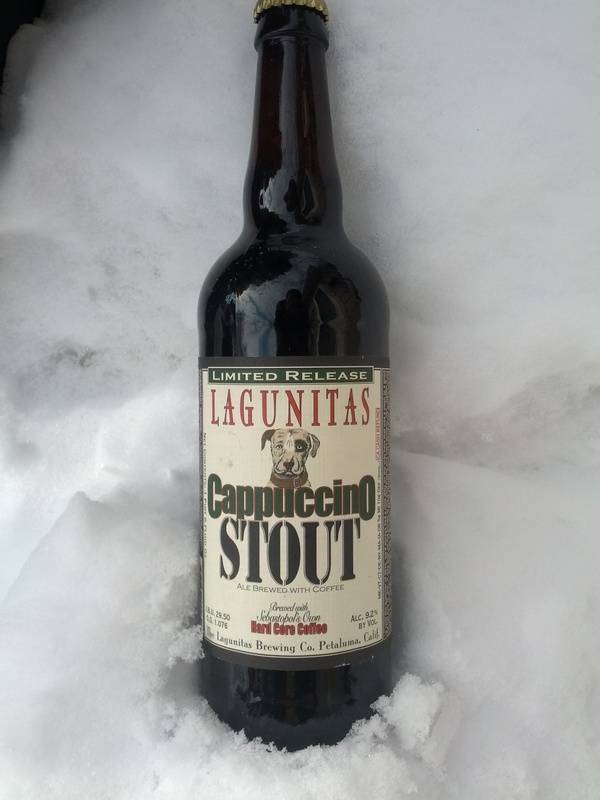 Lagunitas Cappuchino Stout is a delicious beer. It’s not complex or revolutionary but it tastes really good after a meal. It would taste even better shared with 1-2 friends. At this price, it’s hard to beat. It is recommended. Style: Imperial stout with cocoa and mint flavoring added. Thanks to Rhiannon for this bottle. Appearance: Black coffee with a lacy beige head. Nose: Dark roasted malt, dark chocolate, faint herbal note. On the palate: Full bodied and sweet. Like a Shamrock Shake upon initial entry. Some bitterness does surface later and on subsequent sips. Very dark chocolate, Espresso with a shot of peppermint schnapps. Finish: Long, bitter and slightly sweet. The mint is in the background but still present. Parting words: I wasn’t so sure what this beer was going to be like, but my doubts were unfounded. It’s delicious. The cocoa dovetails with the Stout-ness perfectly even to the point where I don’t think I would notice it if I didn’t already know it was there. The mint is noticeable but subtle, especially as the beer sits in the glass. I would have preferred a little more mint, but that’s a quibble. I also don’t know if adding cocoa was really needed but it didn’t hurt. I received this beer as a gift from my cousin, so I’m not sure how much it sold for, but I’ve been able to find it online for $3 for a 12 oz. bottle. That’s not cheap, but since this is more of a novelty than a go-to brew, I wouldn’t mind paying that for a bottle or two. 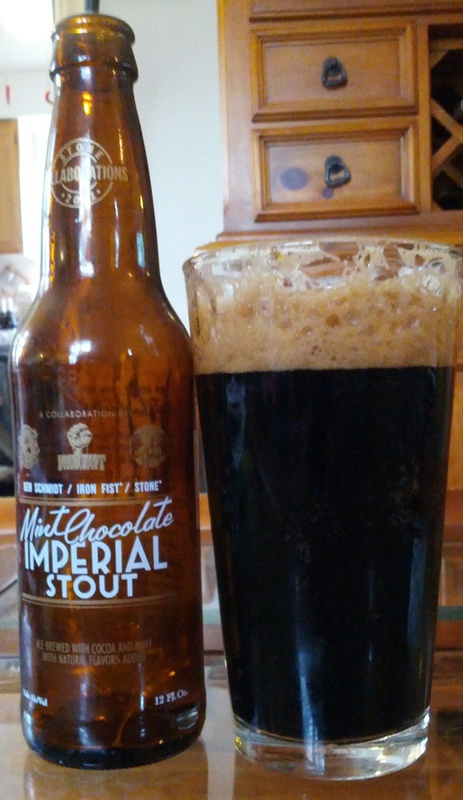 Mint Chocolate Imperial Stout is recommended. Maker: Bell’s, Kalamazoo/Comstock, Michigan, USA. Thanks to Brian for leaving three of these at my house! Appearance: Dark coffee brown with a creamy beige head. On the palate: Full-bodied, creamy, and slighly fizzy. Chocolate brownies with raspberry morsels mixed in while drinking a cup of Ethiopian Harrar coffee. I know that sounds nuts, but 1) that’s how it tastes and 2) Shut up. Finish: Intense, but not heavy-handed. Like sucking on a wedge of dark (70%+) chocolate. Fades away very slowly leaving a delicious and slightly bitter coating all over the lips and tongue. Parting words: Wow. 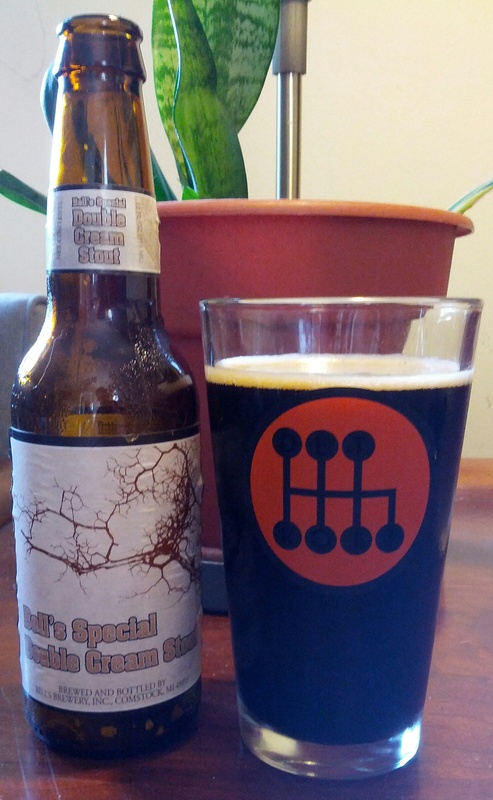 Bell’s Double Cream Stout is a fantastic beer, probably the best stout I can remember having ever. The depth and subtlety of this beer is just stunning. I found myself wracking my brains trying to pick out flavors and descriptors for this review, even moreso than I usually do for beers! There was a lot more there than I could put into words. For long-time Michigan microbrew drinkers, Bell’s can seem old hat at times. Oberon comes in mini-kegs and 12 packs here and I sometimes find myself rolling my eyes at the raving about Bell’s by out of state beer drinkers. “Oh you’re excited about picking up some Oberon and Two-hearted Ale today are you? How cute.” This stout shows very clearly why Bell’s has become the juggernaut (by microbrew standards) it is. Bell’s Double Cream Stout is a masterpiece and highly recommended. Appearance: Dark chocolate brown with a pale head. Nose: Bitter chocolate, black cherry. On the palate: Medium-bodied. Rich, roasted grain flavors. Burnt toast, brandy, espresso beans. Finish: Long and bitter. Like finishing a cup of French Roast. Parting words: This beer delivers on the promise of the name. It’s like a dark roast coffee with a bowl of breakfast cereal in stout form. It’s rich in flavor and certainly potent at over 8% ABV, but not excessively boozey either. Goes well with a rich, cheesy meal or as just a meal in itself. One of Founder’s (and Michigan’s) best beers. 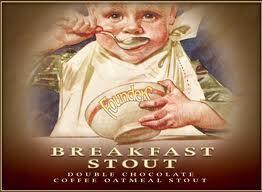 Breakfast Stout is highly recommended.